The bundle is affordable and very easy to play. The accompanied tuner will allow you to tune instantly. It is durable but you are advised not to drop it ever. The sound quality is great especially at that low price. You should buy a better quality strings to get good sound. The gig bag is thin and you may need to buy a better one. 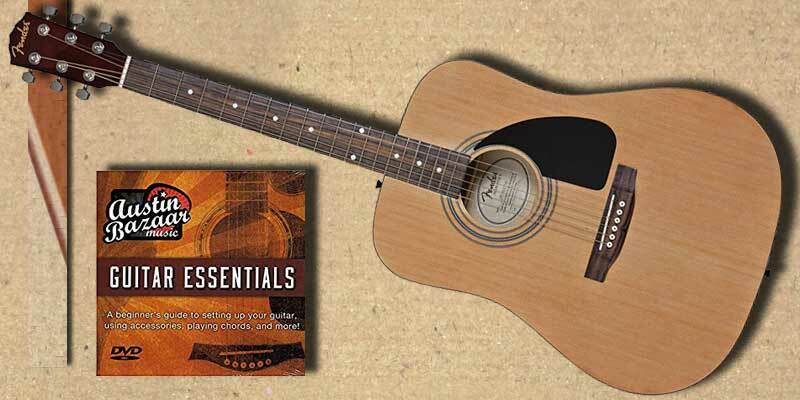 The Fender acoustic guitar bundle is the best deal for a beginner. 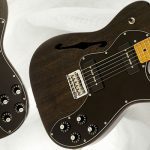 You will not only get a great-sounding, full-body guitar but will also get many accessories that will give you a worthwhile playing experience. 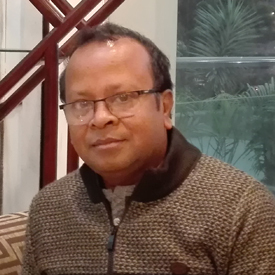 The materials used are great at its low price and the accompanied accessories are fairly basic. This bundle is ideal for you if your budget is low and you are looking for a guitar that will produce great sounds. Fender is a popular brand in the music industry with many quality products like Fender FA-100 that can stand the test of time. 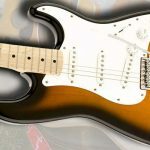 Narrowing it down to the guitar industry, the name Fender is associated with innovation. It is not possible to talk about rock ‘n’ roll, rhythm and blues, jazz, western, country music, etc., without acknowledging the contributions of this wonderful brand. The Fender acoustic guitar bundle is a perfect beginner pack for you because of its contents – a Fender full-body guitar, gig bag, tuner, strings, strap, picks, Austin Bazaar instructional DVD and polishing cloth. 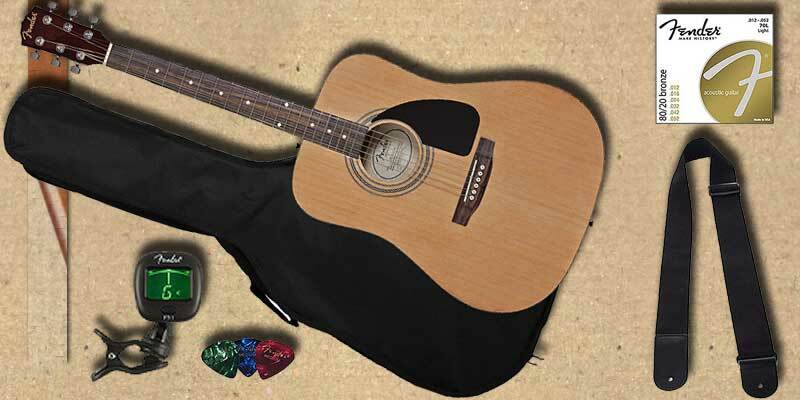 The Fender FA-100 acoustic guitar bundle comes with a full-body guitar that has the ability of producing loud sound. You can be assured of durability as well as comfortability you expect from your first guitar. The bridge and fingerboard are made of rosewood with compensated saddle and the use of rosewood ensures that the sound quality is not compromised. Furthermore, solid spruce is used to make the top and this accounts for its durability as well as stability after being tuned. There is also the die-cast chrome tuners which ensure that you don’t get out of tune every time. The spruce wood and chrome tuners will give you the opportunity to play your guitar for a long period of time. 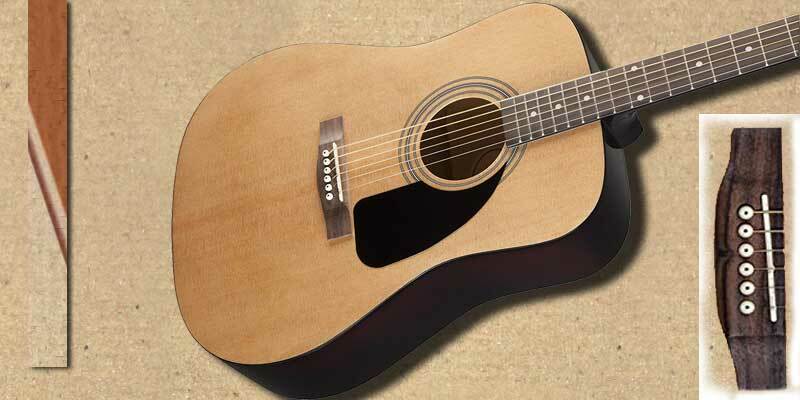 The back and sides of the Fender acoustic guitar are produced from laminated agathis. It is a good alternative to mahogany, yet the vibrant and warm tone expected is not compromised. The nuts as well as saddle are made from urea and the strings can withstand stress through constant strumming and finger picking because they are of high quality. Included in this great bundle is a tuner which is very easy to use. You only need to clip it to the head of your guitar and it picks up the vibrations and sounds. A tune is held so that you don’t need any serious tuning unless after changing strings. If you are a beginner that only plays at home, the clip-on tuner is ideal for you but if you want to play outside of home or jam with your friends, you can get a better tuner. The Fender acoustic guitar bundle has an extra pack of phosphor brown strings and this is the best bargain you can ever ask for. You can easily change the strings when the default ones are no longer doing the job properly. The DVD is one of the things that makes this guitar bundle unique. Beginners need not to worry about how to start playing the guitar because the DVD handles just that. It covers almost everything you need to know from holding the guitar to basic chords and strumming. It is well-structured and you can learn at your own pace. You can pause and play as you like without falling out of rhythm or forgetting what you have learnt. The DVD is your own and you can refer back to it at any time while you can give it to family and friends who are interested in learning how to play the guitar. The type of pick you use to play your guitar is very important, especially if you are a beginner, because it will determine the type of pick you will get used to. You will find medium picks in this bundle and such picks are very much common. 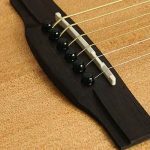 They hold up properly and are very flexible, hence, when you become comfortable with strumming, you won’t have any problem in maneuvering between strings ensuring that you don’t strike the wrong ones. The strap and gig bag in this bundle will give you the opportunity to move around with ease and jam with friends. A gig bag is indispensable for every player because you won’t want to ruin your guitar by allowing it to sit out in the sun or somewhere where pets can damage it. The gig bag will protect your guitar from sun damage, scratches or any other incident. However, you should be careful with the zippers because they can break easily since they are not of highest quality. You should also be gentle with the strap especially when adjusting it to your size. The polishing cloth is also a plus but don’t use it with water in order not to damage your instrument. You should use the cloth dry and you can buy some guitar cleaner from a music store. 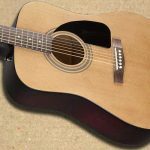 Even though you will get the Fender acoustic guitar bundle at a very low price, its sound is very decent. The distance between the frets and strings is ideal giving you the opportunity to create chords with so much ease. The wood used for producing it brings out loud and large sound which is ideal for a beginner. It is very good for soul and folk genres as well as open-positioned chords. 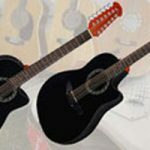 Is Fender FA-100 Acoustic Guitar Bundle Recommended? Most gurus recommend that you purchase Fender FA-100 which comes with a bundle of all necessary accessories. It is a great saver in money terms for the beginners and those who love to play dreadnought style guitars. The sound quality is awesome and you must love to play it. You will also be happy to get the accessories that you need to purchase separately. Not all guitars come with a bundle offer but this one which will makes you a happy buyer.